The Churchill Mark I was the first ‘Mark’ (the term (‘Mark’) used to designate different versions of equipment) of the Infantry Tank Mark IV, Churchill (A22). 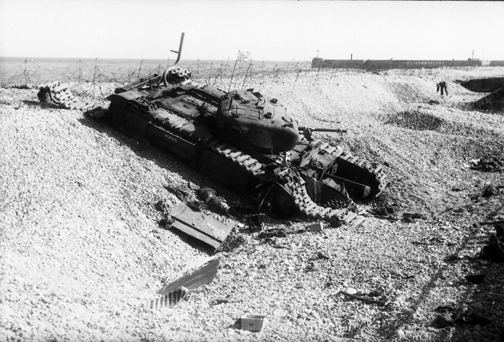 The Infantry Tank Mark IV, Churchill (A22) itself, was an ‘Infantry Tank,’ specifically designed for fighting in support of infantry operations. For this role, the requirements for an infantry tank, as the British General Staff saw it, were that the tanks have heavy armour, powerful armament, good obstacle-crossing performance, and reasonable range and speed. It was the fourth in the family of infantry tanks that had been developed by the British. The three previous infantry tanks developed by the British, was the Infantry Tank Mark I, Matilda I (A11), the Infantry Tank Mark II, Matilda II (A12), and the Infantry Tank Mark III, Valentine. Within the Canadian Army Overseas, the units of the 1st Canadian Army Tank Brigade were the main Canadian users of the Churchill infantry tank. Between July 1941 and May 1943, the brigade was equipped with the Churchill Mark I, Mark II, Mark III, and Mark IV tanks. 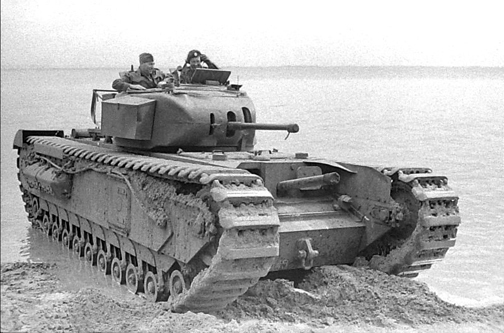 A Churchill Mark I of the Calgary Regiment training on a beach near Seaford, Sussex, in July 1942. Source: MilArt photo archives. The Churchill Mark I was designed by Vauxhall Motors Limited in Luton, Bedfordshire, England, who also acted as parent to a group of companies charged with the production of the Infantry Tank Mark IV, Churchill (A22). Working under tremendous pressure, Vauxhall Motors had the first tank completed and ready for testing in December 1940, only twenty-two weeks after having started detailed design work. Unfortunately, because they had been instructed to have it in production within one year, the possibility of detailed user and development trails was virtually eliminated. With the issue of the first production models of the Churchill to units to begin in June 1941, Vauxhall was forced to work straight from the drawing board. This lead to some “teething troubles” with a few futures in the design and construction of the tank in early models only, which could give rise to troubles not normally expected in service. Vauxhall addressed this issue by inserting a four-page small yellow leaflet (dated May 1941) into the Churchill tank user handbook, addressed to crews, mechanics and workshop personnel, listing the defects known in advance to all who would handle the vehicle, and to outline the precautionary measures necessary to minimize them, and to explain that the defects existed solely because of the inadequate time that was available for comprehensive testing. 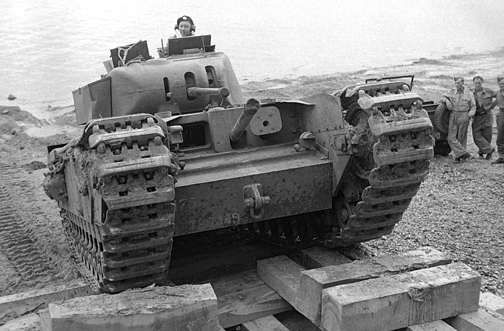 Despite the problems, it did not take long to correct all the Churchill’s defects, and for the tank to become mechanically a very reliable vehicle. Vauxhall’s engineering teams, seconded to British and Canadian regiments who were training with Churchill tanks, sent a steady stream of information back to the factory, which constantly led to modifications and improvements. The combination of the Vauxhall teams and the Churchill crews, working hand-in-hand through the first formative months of the Churchill’s service, led to their crews knowing their tanks more intimately than could have been achieved with the most intensive training. Coupled with the aforementioned measures, the decision was taken in November 1941, that a rework programme would be carried out to correct some of the tank’s more glaring faults, and to bring many Mark I and Mark II tanks up to the current standard of the Churchill Mark III. Vauxhall Motors in Luton, Bedfordshire, and Broom & Wade in High Wycombe, Buckinghamshire, England, were both authorized to turn their production lines over to this rework programme, starting respectively, on 1 March and 1 April 1942. The Churchill Mark I had 102-millimetre thick armour (with a minimum thickness of 16-millimetres), making it one of the most heavily protected tanks built to that time. It weighed approximately 39-tons, and was 7.4-metres in length, by 3.3-metres in width, and stood at a height of 3.8-metres. It was powered by a 350-brake horsepower, 12-cylinder, horizontally-opposed engine, which could produce a road speed of 25-kilometres per hour and a cross-country speed of 13-kilometres per hour. The Churchill Mark I had an onboard fuel capacity of 682-litres, carried in six interconnected fuel tanks, three each side, located within the engine compartment. Also, the Churchill Mark I had an auxiliary fuel tank mounted on the outside rear hull, which carried an additional 148-litres. This auxiliary tank was connected to the main fuel system, but could be jettisoned from the tank in an emergency. This gave the Churchill Mark I a total fuel capacity of 830-litres allowing a cruising range of 145 to 201-kilometres. The Churchill Mark I mounted a 2-pounder gun (capable of penetrating 57-millimetres of armour at 457-metres) and a coaxial Besa 7.92-millimetre machine gun in the turret, along with a 51-millimetre smoke bomb thrower in the turret roof, and a 3-inch howitzer (with a range of 1,829 to 2,286-metres) mounted in the hull front plate alongside the driver. The armour piercing capability of the 2-pounder and the high explosive capability of the 3-inch howitzer gave the tank a balanced armament. The 2-pounder was considered to be obsolescent by 1940, but was still being produced in quantity to replace losses in France. The factories could not spare the time to retool for the production of a heavier gun, due to the urgent need to re-equip the British Army after Dunkirk. The 2-pounder gun had an elevation of minus 15-degrees to plus 20-degrees, while that of the 3-inch howitzer was minus five degrees to plus nine degrees. The traverse of the 3-inch howitzer mounted in the hull front plate was restricted by the width of the hull between the horns. The Churchill Mark I had a crew of five (a commander, a gun layer, a loader/(radio) operator, a driver, a co-driver/hull gunner) men, all of whom was cross-trained. 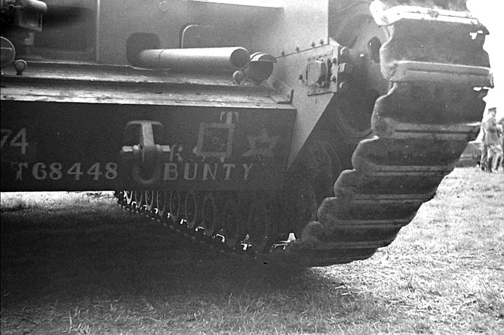 A Churchill Mark I of the Calgary Regiment, note the placement of the 3-inch howitzer in the front hull plate. Source: MilArt photo archives. A Churchill Mark I of the Three Rivers Regiment, note the restricted traverse of the hull mounted 3-inch howitzer. Source: MilArt photo archives. The hull was divided into four compartments. At the front, the driving compartment also housed the howitzer gunner. Behind that was the fighting compartment containing the electrically-operated three-man (commander, gun layer, and the loader/(radio) operator) turret. Further to the rear was the engine compartment, followed by the rear compartment housing the gearbox, main and steering brakes, air compressor, auxiliary battery charging set, and a turret power traverse generator. The hull was constructed of flat steel plates connected together with heavy steel angle irons, with rivets being used to secure the plates to the angle irons. The floor was flat and free from projections, and panniers were provided at each side between the upper and lower runs of the track for storage of equipment. The construction of the panniers was described as a double box girder, because each pannier formed a rectangular structure on each side of the hull, which created a hull of immense strength. The whole hull structure was suitably braced by cross girders and by the bulkheads that separated the various compartments. The large square door (escape hatch) provided in each pannier just behind the driver and hull gunner positions was an unusual provision for British armoured fighting vehicles of this period, but was also very welcome by crews. Many a crewman who served as a driver or hull gunner on a Churchill is alive today because of these pannier doors. These doors could be opened or closed only from the inside, but the locking handles were designed so that the doors were automatically secured when they were closed. Each of these doors was provided with a circular pistol port, and two pistol ports were also provided in the turret. Double-hinged doors were provided in the hull roof above the driver and front gunner. They were normally operated from inside, but could be opened or secured from the outside by using a suitable key. The turret of the Churchill Mark I, which was cast entirely as one piece, was the first attempt by British steel makers to create a complete turret as a single bulletproof steel casting. Also, the turret of the Churchill Mark I, had no protective mantlet, instead having just three slots in the bulletproof steel casting for the 2-pounder gun, the coaxial Besa 7.92-millimetre machine gun, and the sighting telescope. The turret could be controlled electrically when the engine was running, or it could be rotated by hand when the engine was stopped. When controlled electrically, the turret could be rotated at a fast speed of 360-degrees in 15 seconds, or at slow speed in 24 seconds. A cupola that could be rotated by hand independently of the turret was mounted in the turret roof for the use of the tank commander, which was rotatable by hand independently of the turret. A large hatch, closed by steel doors, was provided for the loader and gunner. A No. 19 wireless set (radio) was housed in the turret. This set included an “A” set for general use, a “B” set for short range inter-tank work at troop level, and an intercommunication unit for the crew, so arranged that each member could establish contact with any one of the others. A Churchill Mark I of the Calgary Regiment, note the Mark I’s cast one-piece turret and the absence a mantlet. Source: MilArt photo archives. For optics and viewing, the driver was provided with a large vision aperture, which could be reduced to a small port protected with very thick glass. When necessary the small port could also be closed. The driver and hull gunner both had periscopes, and there were two other periscopes mounted in the front of the turret for the loader and gunner. The commander’s cupola was fitted with two periscopes. A Churchill tank driver’s vision was more restricted than on other tanks, because the driving compartment was set back so far from the forward track horns. 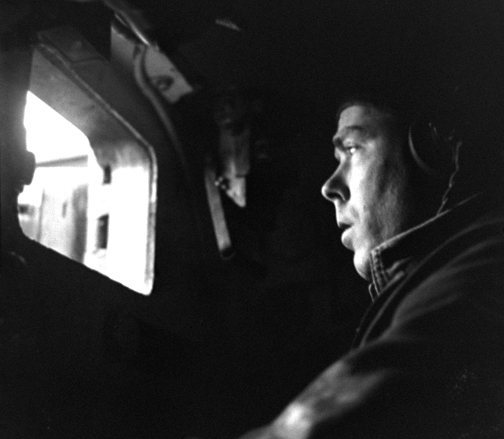 Churchill drivers could see ahead, but could see very little on either side of the vehicle, and they relied on the tank commander to warn them of obstacles. The driver’s large vision aperture, which could be reduced to a small port protected with very thick glass. Source: MilArt photo archives. As mentioned earlier, there was adequate provision for stowage of ammunition and equipment, with the Churchill Mark I, able to accommodate the stowage of 150 rounds of 2-pounder ammunition, 58 rounds of 3-inch howitzer ammunition, 4,725 rounds of 7.92-millimetre ammunition, and 25 smoke bombs. Additionally, each tank also carried one .303-inch Bren (Mark I) light machine gun with an anti-aircraft mounting and six 100-round drum type magazines, two .45 calibre Thompson sub-machine guns with six 50-round drum type and ten 20-round box type magazines each, and one Signal Pistol, No. 1, Mark III, with twelve cartridges (four red, four green, four white). Designated stowage locations for vehicle tools, spare parts, and equipment, and the crew’s personnel equipment, were also provided. A Churchill Mark I of the Calgary Regiment, note the Bren light machine gun in its anti-aircraft mounting on the turret roof. Source: MilArt photo archives. On 4 December 1941, No. 1 Sub Depot of No. 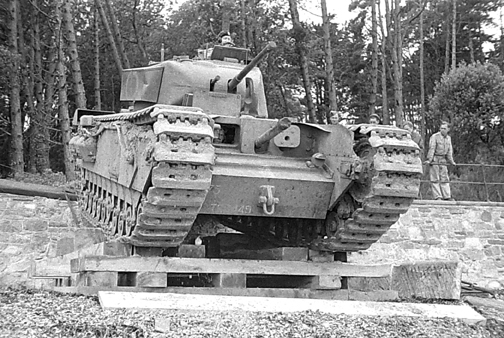 1 Canadian Base Ordnance Depot, Royal Canadian Ordnance Corps, located at Bordon Camp, Hampshire, England, began to receive Churchill Mark I tanks from the British for issue to the three army tank battalions (later redesignated army tank regiments on 15 May 1942) of the 1st Canadian Army Tank Brigade. The brigade (which was the first formation of the Canadian Armoured Corps sent overseas) had arrived in the United Kingdom at the end of June 1941, and was to have been equipped with the Canadian-built Infantry Tank Mark III, Valentine, before leaving Canada. However, because of delays in Canadian tank production, the British War Office was asked to lend tanks to the incoming 1st Canadian Army Tank Brigade. These would be replaced with Canadian-built tanks when Canadian production problems were overcome. With the support of the British Army’s Commander of the Royal Armoured Corps, this endeavour was successful, and immediately upon arrival in the United Kingdom, 1st Canadian Army Tank Brigade was able to draw equipment on a respectable training scale. The 11th Canadian Army Tank Battalion (The Ontario Regiment (Tank)) was equipped with the new Churchill Mark II tank (built to the same specifications as the Churchill Mark I, except that the 3-inch howitzer mounted in the hull front plate was replaced by a Besa 7.92-millimetre machine gun), straight from the Vauxhall Motors production line. In the meantime, until such time as more Churchill tanks became available, the Infantry Tank Mark II, Matilda II (A12), were issued to the 12th Canadian Army Tank Battalion (The Three Rivers Regiment (Tank)), and 14th Canadian Army Tank Battalions (The Calgary Regiment (Tank)), but by the end of December 1941, all three tank battalions of the brigade were equipped with Churchill tanks. At this time, a Canadian army tank battalion was organized, equipped, and manned, as per the War Establishment of a Canadian Army Tank Battalion (Cdn III/1940/33A/1) of 11th February 1941. The war establishment was a document that specified the organization of a unit, and its authorized entitlement for personnel, vehicles, and weapons. The document was updated whenever the unit was reorganized or they received new equipment. Under War Establishment (Cdn III/1940/33A/1), a Canadian army tank battalion included a battalion headquarters, headquarters squadron, and three tank squadrons. The battalion headquarters included four cruiser or infantry close support tanks. The headquarters squadron had a squadron headquarters, an intercommunication troop with nine scout cars, and an administrative troop. Each of the three tank squadrons had a squadron headquarters and five tank troops, each with three infantry tanks. The squadron headquarters had three tanks: one cruiser or infantry tank, and two cruiser or infantry close support tanks. In all, each Canadian army tank battalion, was entitled to an overall tank strength of 58 tanks. 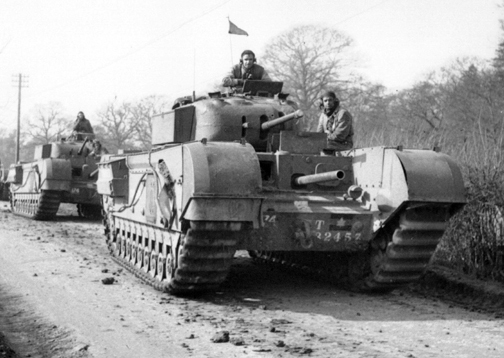 Although initially issued to the army tank battalions of 1st Canadian Army Tank Brigade, against their war establishment entitlement of cruiser or infantry tanks, as time went on and more Churchill Mark II tanks became available (along with the Churchill Mark III in April 1942), the Churchill Mark I was employed in the squadron headquarters in place of the infantry close support tanks. A reworked Churchill Mark I of the Ontario Regiment, note the driver’s small vision port protected with very thick glass. Source: MilArt photo archives. Under the previously mentioned rework programme, Canadian-held Churchill Mark I tanks started to be withdrawn on 30 May 1942. These tanks were returned to the British Army’s Chilwell Mechanical Transport Sub-Depot, Royal Army Ordnance Corps, located at Vauxhall Motors in Luton, Bedfordshire, England. There, once all tank stores and wireless (radio) equipments were accounted for, the tank was struck off charge of the Canadian Army Overseas. 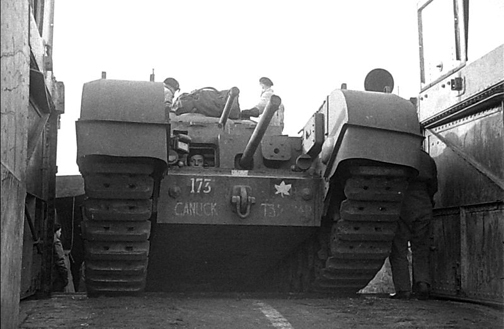 New or reworked Churchill tanks were in turn issued to the Canadian Army Overseas through No. 1 Canadian Base Ordnance Depot, to replace those that had been turned in. From the end of May 1942 onwards, there was a continuous stream of Churchill Mark I tanks being withdrawn from the units of 1st Canadian Army Tank Brigade and new or reworked Mark I tanks being issued to replace them. This process continued until March 1943, when the decision was made to replace the brigade’s Churchill tanks with the Canadian-built Cruiser Tank, Ram Mk II. Not all of the Churchill Mark I tanks operated by units of 1st Canadian Army Tank Brigade had to be reworked. In July 1942, Canadian Military Headquarters (London, England) issued a list of tanks, that were not affected by the rework programme. Two reworked Churchill Mark Is of the Three Rivers Regiment on exercise somewhere in England. Source: MilArt photo archives. By the time of Operation Jubilee, the ill-fated combined operations raid carried out against the port of Dieppe, France, on 19 August 1942, the Calgary Regiment, held six Churchill Mark I tanks, all employed as close support tanks, with two each in squadron headquarters, of the regiments three squadrons. All six of these tanks were reworked Churchill Mark Is which had been recently issued (two on 20 June, and four on 6 July 1942) to replace Mark Is that had been withdrawn from the regiment under the rework programme. Of these six tanks, four were lost at Dieppe while serving with “B” and “C” squadron headquarters. The two Churchill Mark I tanks serving with “A” squadron headquarters returned to England, with the squadron not having landed. It would not be until 23 October 1942, that these losses to the Calgary Regiment would be replaced. A reworked Churchill Mark I of the Calgary Regiment’s “B” Squadron Headquarters knocked out at Dieppe. Source: Authors’ image file. 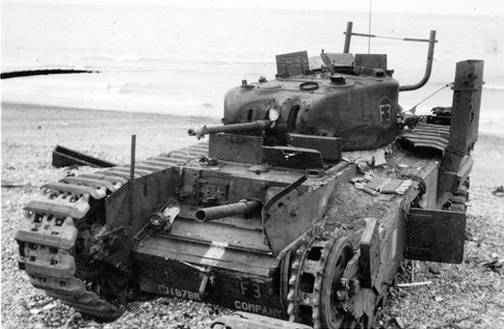 A reworked Churchill Mark I of the Calgary Regiment’s “C” Squadron Headquarters knocked out at Dieppe. Source: Authors’ image file. As of 5 January 1943, among the three tank regiments of 1st Canadian Army Tank Brigade, a total of 36 Churchill Mark I tanks (11 of which were reworked), were held on strength of the brigade. As of 1 March 1943, 16 reworked Churchill Mark Is, were held among the three tank regiments of the brigade. With the previously mentioned decision having been made to replace the brigade’s Churchill tanks with the Canadian-built Cruiser Tank, Ram Mk II, the brigade’s Churchill Mark I tanks, began to be withdrawn on 22 March 1943, with three Churchill Mark Is of the Calgary Regiment, being returned to No. 1 Canadian Base Ordnance Depot, Royal Canadian Ordnance Corps (Bordon Camp, Hampshire). This was followed on 26 March, with the withdrawal of four Churchill Mark Is of the Ontario Regiment, and finally on 29 March, with the withdrawal of the six Churchill Mark I tanks of the Three Rivers Regiment, and the withdrawal of the remaining two from the Calgary Regiment. On 11 May 1943, the last remaining two Churchill Mark Is (which were held on strength of the Ontario Regiment), were turned over to the British 148th Regiment, Royal Armoured Corps, at the British School of Infantry at Catterick, North Yorkshire, England. In all, at one time or another, between 4 December 1941 and 11 May 1943, approximately 70 Churchill Mark I tanks (24 of which were reworked Mark Is), were held on the strength of units of the 1st Canadian Army Tank Brigade. More information on the Churchill Mark Is which served with the Canadian Army Overseas can be found at Ram Tank under the Churchill Registry heading. The author wishes to thank Clive M. Law, for providing photos from the MilArt photo archives, and for publishing this article. Any errors or omissions, is entirely the fault of the author. Tonner, Mark W., The Churchill in Canadian Service (Canadian Weapons of War Series), 2010, Service Publications; Ottawa, Ontario, Canada. ISBN 978-1-894581-67-7, and The Churchill Tank and the Canadian Armoured Corps, 2011, Service Publications; Ottawa, Ontario, Canada. ISBN 978-1-894581-66-0. Some impressive research on this blog.